A great opportunity! …to chat with Thom Mayne, the Design Director for Creative City Campus, the founding principal of Morphosis Architects. Morphosis and Teeple Architects will share some insight about key issues related to contemporary architecture, design, beauty and built form. They are eager to hear questions and thoughts from the OCAD U community related to your projects, research, and passions. Thom Mayne, tis a founder and design principal of Morphosis, an interdisciplinary and collectively organized architecture firm. Morphosis has always been known for uncompromising designs and a drive to surpass the bounds of traditional forms and materials, while also working to carve out a territory beyond the limits of modernism and postmodernism. The firm was founded in 1972 by Mayne and Jim Stafford and one year later Michael Rotondi joined them and remained as partner until 1991. Types of buildings undertaken by Morphosis range from residential, institutional, and civic buildings, to large urban planning projects. Thom Mayne was born in Westbury, Connecticut in 1944. He lived for part of his childhood in Gary, Indiana. When he was ten, his mother moved the family to Whittier, California. Although he enrolled in California State Polytechnic University, Pomona, he received his bachelor of architecture degree from the University of Southern California in 1968. He then worked for two years as a planner for Victor Gruen. He began his teaching career at Cal Poly at Pomona, but soon he, along with six colleagues, was fired. That was the genesis of the founding of the Southern California Institute of Architecture (SCI-Arc) in 1972. He returned to school and received his master of architecture degree from Harvard University in 1978. He has held teaching posts at Columbia University, Harvard University, Yale University, the Berlage Institute in the Netherlands and the Bartlett School of Architecture in London. The Creative City Campus (CCC) project will revitalize and expand the institution’s core creative spaces on McCaul Street. The project involves approximately 55,000 square feet of new construction and 95,000 square feet of renovation and repurposing of existing space in and around the existing facilities of the university. A preliminary outline of project objectives is listed below but is subject to change, following the outcomes of the engagement strategy. Development and financing strategies will be developed in 2017. Over the Summer and Fall of 2019, the Fabrication Studios (Wood, Metal, Plastics, Rapid Prototyping and Tool Loans) on Level 1 of 100 McCaul St. will be closed and renovated. The studios will close on April 24, 2019. Renovations will be completed by December 31, 2019. 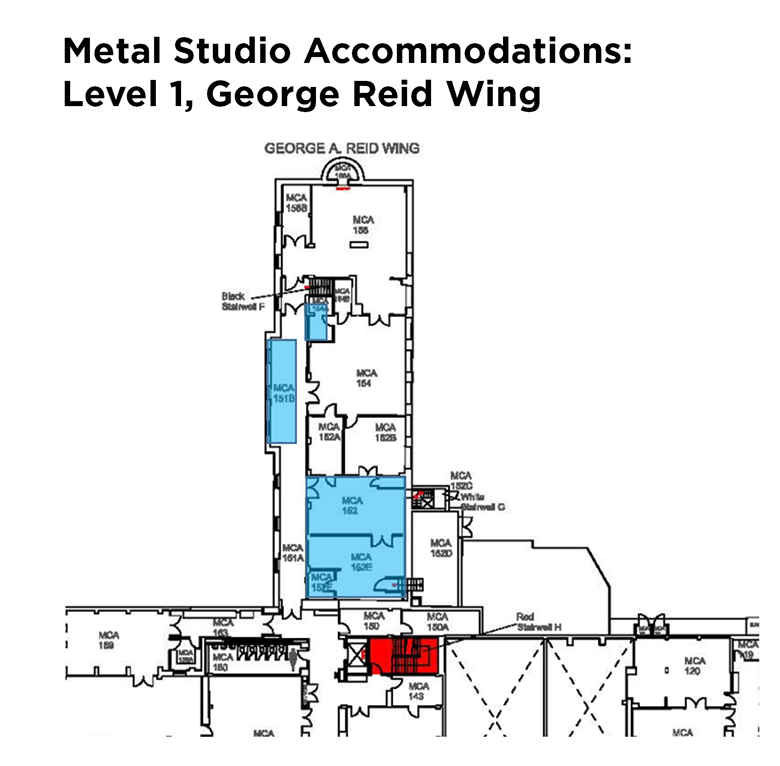 The Wood, Metal, Plastics, Rapid Prototyping and adjacent areas, including studio/seminar spaces in Level 1 McCaul St. will be closed starting April 24 through December 31, 2019 (see diagram). The Assembly Room in MCA 161 will be closed throughout the summer. 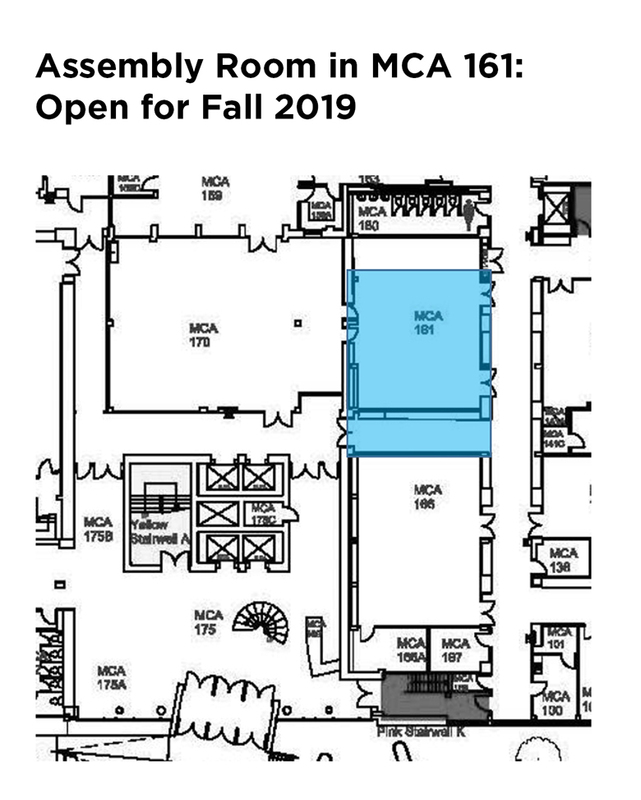 Construction is being phased to ensure this space is reopened in time for the Fall 2019 term, to minimize impact on students and alleviate pressure on the other temporary relocations of the various Fabrication studios (see diagrams). ​How will the studios change? OCAD U recognizes the strong impact this project will have on our students, faculty, course offerings and equipment and process availability. Careful studies were conducted over many months in consultation with key stakeholders across the university to determine the most cost and time efficient approach to the project. The project includes adjusting course offerings as much as possible, in collaboration with Faculty offices and the Registrar. Adjustments are being made to provide as much curriculum as possible in alterative spaces on campus, and to set up as much equipment as possible in temporary locations for use. The university is exploring partnerships with external organizations to fulfill our community’s needs while the work is underway; a process for reviewing needs on a case-by-case basis is being developed and will be announced later this summer. The scope and value contracts for impacted staff and faculty will be maintained (e.g. technicians and faculty will not be reduced; they may be redeployed to other studios to support temporary equipment set ups). MCA 152, proposed to house Metal classes and related work. Exact locations and some shifting during term may be required to align with Foundry processes. Some larger, less frequently used equipment may be located in the hallway recess, MCA 151. MCA 154A, the future Digital Centre, can be used for short term tool and hardware storage. Metal materials storage to remain within the construction area, with scheduled access by the technician only. Integrate additional equipment in MCA 517. Temporarily relocate four additional larger, heavier work benches to MCA 515 to facilitate larger projects. 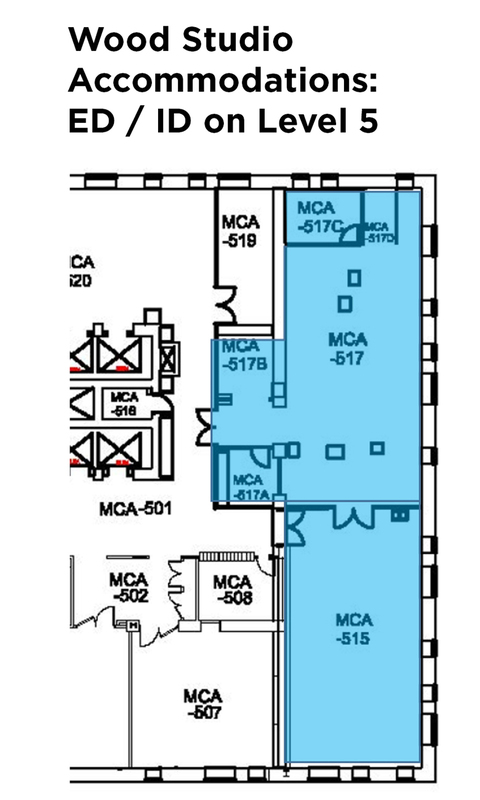 Potentially relocate current storage in MCA 515 to alcove MCA 528, to create space additional work space. The Projects and Studio Management teams are reviewing storage capacity and process to best utilize MCA 517B for material storage. Relocation of Plastics to MCA 316 suite (some minor space alterations are required). Smaller rooms in this space will be set up as needed for equipment and workspace. Required materials and tools will be stored in MCA 316D. All current services, with the exception of the large CNC milling machine will be relocated. Projects and Studio Management team are in the process of purchasing a small CNC milling machine to help support students during the renovations. Large CNC milling requirements to be managed offsite. Materials for RPC will be relocated and stored within the new temporary location in MCA 314. 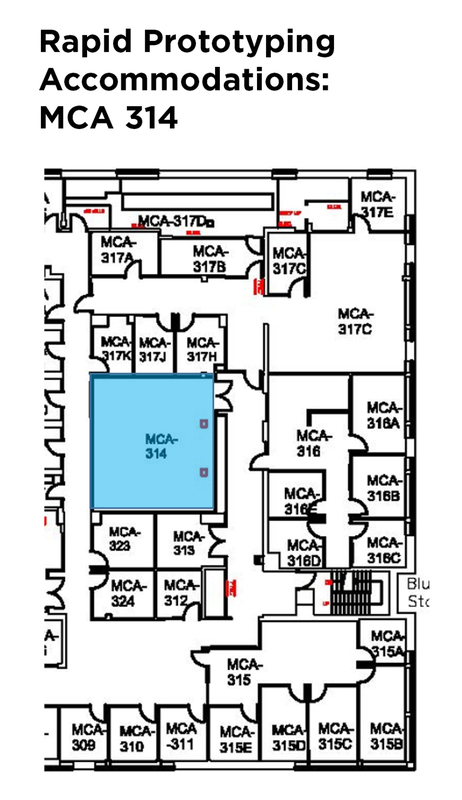 Will be temporarily relocated to MCA 265 (currently known as the Anniversary Gallery in 100 McCaul St.) on Wednesday, May 8 where it will remain for the duration of the renovations. Relocation to available office space in MCF 220 (51 McCaul St.) for the duration of the renovations. 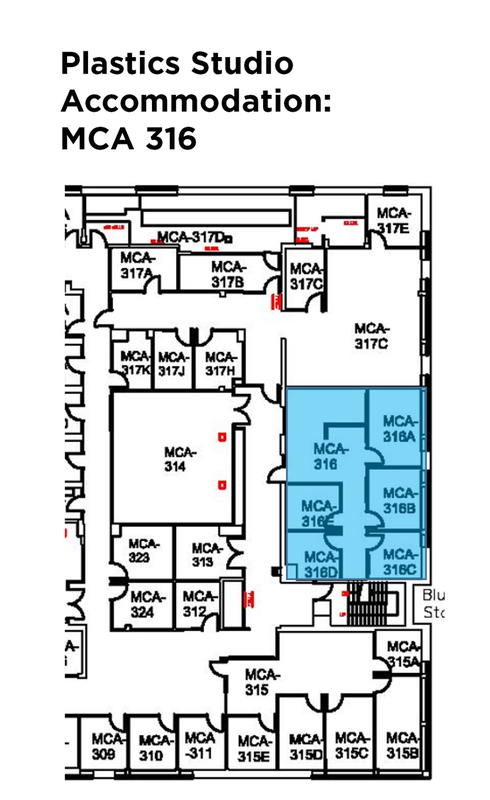 The Studio/Seminar Rooms MCA 166, 140 and 141 will be unavailable during the renovations. 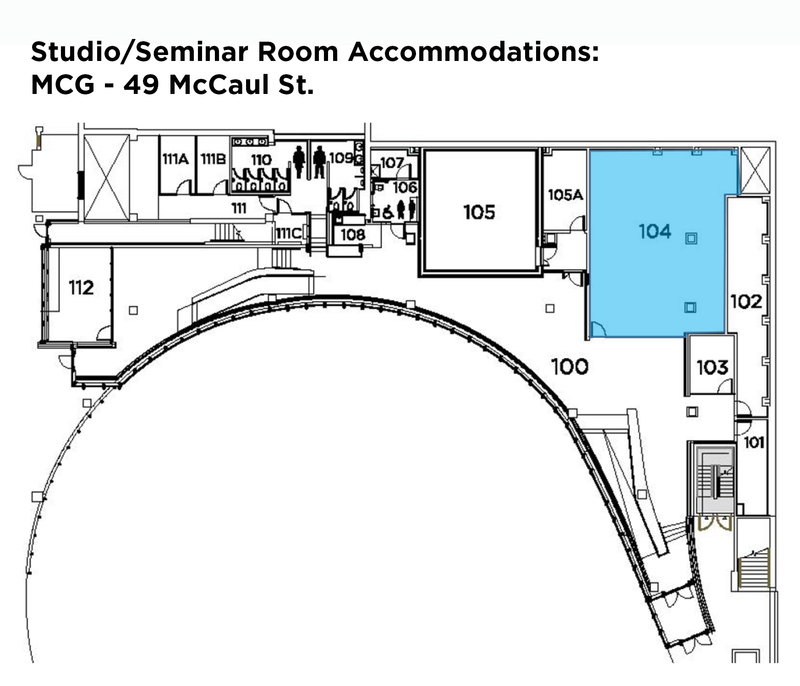 Activities normally delivered in these rooms may be accommodated in MCG 104 (49 McCaul St.) and other spaces around the campus. The community may notice some adhesive odours, and elevators will be put on service mode for brief periods.